Health Secretary Matt Hancock is currently promoting a privately-owned app which is undermining general practice within the NHS. The app, GP at Hand, boasts of allowing users to obtain same day, or next day, face-to-face appointments with GPs. It also claims users can have a video consultation with a GP within two hours of registering their symptoms, a chatbot with world-leading artificial intelligence that can perform diagnostic and triage functions with the same precision as a real doctor, and the ability to dispense prescriptions either to a user’s home or to a location of their choosing. So what’s the problem? Since 2010, the health service has endured the longest spending squeeze in its history. One of the most tangible effects of this has been a growth in waiting times to see a GP. Why wouldn’t we want to have the ability to see a GP on the same day or the next, rather than in two weeks to a month’s time? Well, firstly there’s the issue of cherry picking. Under the current system of GP funding, the money follows the patient. The more patients a GP surgery has, the more money it will have. But GP at Hand operates by using a clause to the GP contract allowing users to register at surgeries outside of the area where they live. The logic being that it is easier for some patients to see a GP near where they work than where they live. But, with GP at Hand, this has led to thousands of (mainly young )patients de-registering from their current GP to use the app –you have to de-register in order to use the app. This means, in turn, that the funding those patients brought with them is now being transferred to Fulham and Hammersmith CCG, the CCG where the app is registered. Incidentally, it ought to be noted that even Hammersmith and Fulham CCG is in financial difficulties – and has had to be bailed out by neighbouring CCGs as a result of pressures caused by the app. As young people visit GPs less than the elderly or those with long-term and complex conditions, the money they bring with them by being registered at a surgery primarily goes towards caring for those with greater needs. This is the very logic which underpins – and ought to underpin – the NHS as we know it. Those who are better off support those who are less well off. In short, we insure one another against harm. But GP at Hand strikes at the very heart of this logic – a logic of social solidarity. It leaves GP surgeries with less money by cherry picking patients, and expects practices to meet the unenviable task of caring for those with the most complex needs whilst their financial resources dwindle. After all, it is precisely those with complex needs who are least likely – and for whom it would be inappropriate – to use an app to access their health care. In turn, cherry picking makes geographic health inequalities worse. An example is Tower Hamlets. Dr Simon Brownleader, Chair of Tower Hamlets GP Care Group, recently pointed out that, despite Tower Hamlets being one of the most deprived boroughs in the country, it had some of the best outcomes nationally for illnesses such as diabetes. This is because at a local level, GP practices have been pooling risks, collaborating on local initiatives and engaging in extensive social prescribing and the streamlining of technologies. Yet, as Dr Brownleader notes, GP at Hand doesn’t participate in the initiatives which have led to such successes. Instead it simply takes much needed money away from successful practices situated in areas of acute need. There is also the issue of safety. GP at Hand boasts of having a chatbot which can supposedly perform diagnostic and triage functions to the standard of a real doctor. This isn’t true. A recent study by the Lancet stated, in respect to the apps’ AI, “there is a possibility that it [GP at Hand] might perform significantly worse”than a real doctor. All of the issues are reason enough for there to be a wider public debate on scrapping GP at Hand. But this issue also brings to light a wider issue. That of to what degree this current – and past – Conservative government is deliberately manufacturing a situation, through the means of austerity, where NHS performance declines. And subsequently utilises that decline as the pre-text to promote the privatisation of the health service. This is the case with Integrated Care Provider (ICP) contracts – formerly known as Accountable Care Organisations – which were born out of the Sustainability and Transformation Plans. 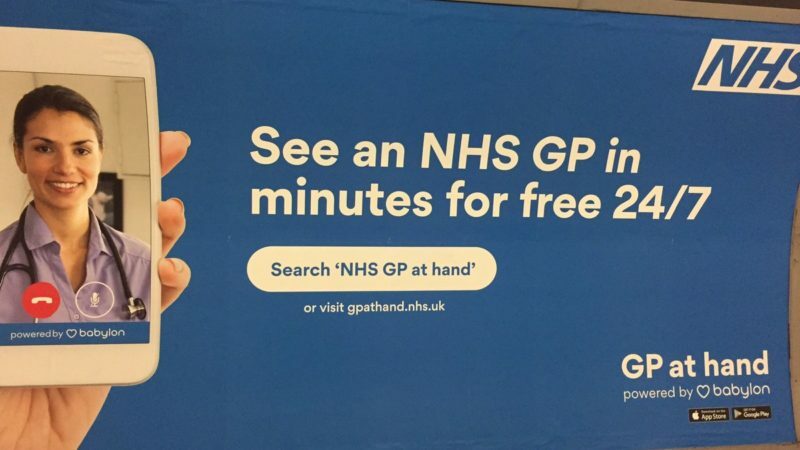 There is no doubt the Health Secretary broke the ministerial code when he appeared in an advertorial paid for by Babylon Health, the owners of GP at Hand. But, to focus solely on the current Health Secretary would be to ignore the wider malaise at the heart of the Conservatives treatment of the NHS. Dr Alex Ashman is the leader of the National Health Action party.